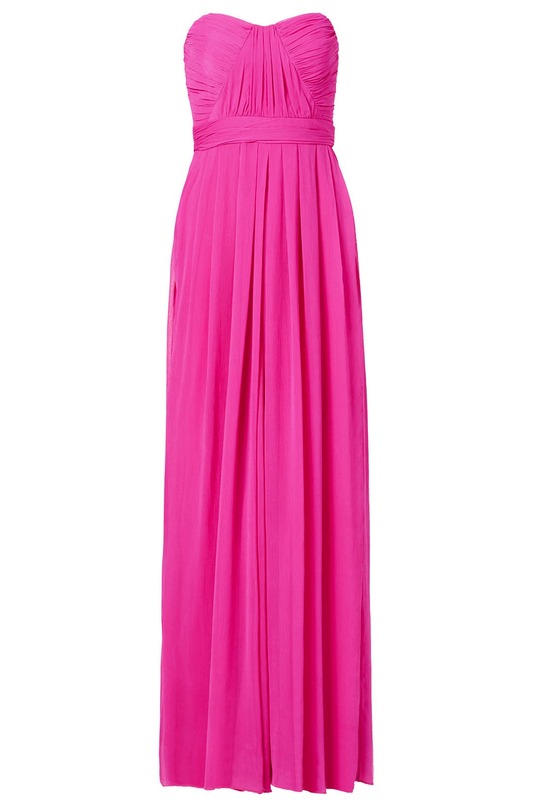 You might be mistaken for a celebrity in this brilliant pink gown by Badgley Mischka. This dress runs true to size. We recommend going one size down for backup (see following fit notes for exceptions). Sized: 0-12 & plus 16W-22W. 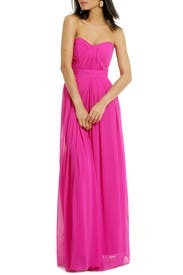 Hot pink crinkle chiffon (100% polyester). Strapless sweetheart neckline. Ruched bodice. Hook-and-eye closure. Hidden back zip. Imported. See size and fit tab for length. i am smaller up top than my 34dd size would indicate so my regular size 6 was to small. beware this is super long and the regular length was also way to long for my 4 inch heels. if i tapped up the entire top it still would have been way to long to wear-maybe if i had ordered the size 4r it would have worked better. THE COLOR IS BEAUTIFUL and i really really wanted to wear the dress. Which one was the winner? I would love to see it! 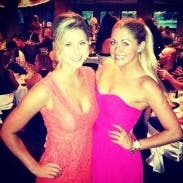 RENT THE RUNWAY WAS PERFECT TO WORK WITH!!! THE DRESS IS AMAZING!! THE COLOR IS BEAUTIFUL. 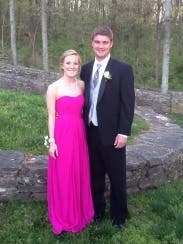 MY DAUGHTER WENT TO PROM AND AND GOT SO MANY COMPLIMENTS. I THINK ALL HER FRIENDS WILL USE RENT THE THE RUNWAY NOW!! SO GLAD WE COULD GET 2 SIZES. I WAS JUST GOING TO GET THE 2 FOR HER, BUT THE 0 FIT BETTER!! THANK YOU!! Where did you get the belt?! I love! Where is the belt from??? I've been looking everywhere! Maybe she got it from Anthro? 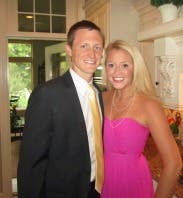 A wedding in Florida calls for some color, loved the dress and the earrings the stylest picked out! Fit true to size. Build-in boning provided good support, wore a strapless bra as well. Gorgeous color. Definitely long, but makes for a beautiful flowy effect when you walk. I wore 4.5" heels and it reached the ground. This dress was amazing! The color was really beautiful and it was very comfortable. It was a little long even in heels so dancing in it was a little difficult once the shoes came off. The torso was constructed magnificently and fit very well. The zipper was a bit tough, but I would highly recommend this dress!! Looks really stunning on and was a good length with tall tall heels. Unfortunately, I had to return it and not wear it because the zipper was too hard to get up and I didn't want to risk breaking it. The material is a little loud when you walk which made it feel kind of cheap, but it definitely didn't look cheap! Would recommend it. This was was really long and flowy. Beautiful material and color. However, it gave me no shape at all - and did nothing for me as my friend said. 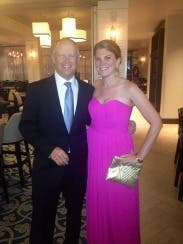 This was my back up dress (thank goodness my main dress worked well!). If you were pregnant - it would probably work really well! 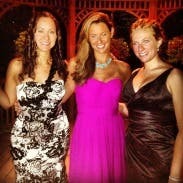 My 34DDD's did fit well in the dress though - I probably could have worn it with out a bra actually. Great color, gorgeous dress, super easy process! This was my first RTR experience. Overall, it was great! The dress came on time, was easy to return and it was great being able to wear a designer gown without paying the designer price! 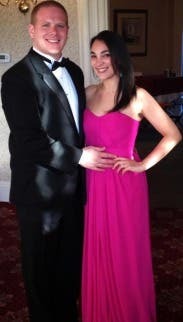 I wore this to my fiance's business school Spring Gala. I got a ton of compliments on this dress! The color was gorgeous- perfect for spring. The only downside was it was very long. I'm 5'4", and wore 4" heels and it was still about an inch too long. If I were to rent a long dress again I'd probably get my second size as the short version, as it was hard to deal with it being long. Fits true to size. I wear a size 6 normally and got a 6 and a 4. I could have worn the 4 but the 6 was more comfortable. This dress me perfectly! 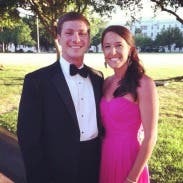 Colorwas perfect for a black tie spring wedding in Florida-everyone was in black! I was wearing 4 inch wedges tho and and the dress was still a little long, but nothing worth stressing about when the dress is so gorgeous...my boyfriend was blushing the minute I put it on! COULDN'T HAVE ASKED FOR A BETTER DRESS! I usually wear in between a 2 and a 4, so I got both sizes and the 2 fit perfectly! I'm a 34 B and the bust worked perfectly on me. I'm 5'3 and the dress was a little long even with 4 inch heels so I had to tack it up, but overall the dress was amazing and I got a lot of compliments! Beautiful dress but maybe too popular. The color of this dress is sooooo much better in person. Photos just don't do it justice. It's very long but I had sky-high heals (4'' heals w/1.5'' platform) that kept it just off the floor. I still had to lift it most of the night but it wasn't too bothersome. The only warning I have about this dress is how popular it is... in style and color. 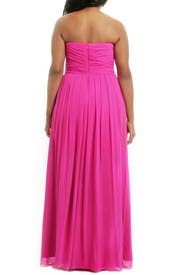 BEWARE of fellow RtR'ers showing up in this dress. I would not rent this dress again for that reason alone. When I first looked at the dress on the hanger, I was worried it would be too small. But it zipped up fine and fit perfectly. I hate seeing girls tugging at the top of strapless dresses, and never wear them myself, so I was nervous about this dress being strapless. But it has very sturdy boning throughout the entire bodice which held it in place the entire night, even while dancing up a storm. It was a little on the long side, but I mostly only had to hold it up when I went up or down stairs. But on the plus side, because it was so long, nobody saw my shoes, so I was able to wear my comfy wedge sandals (~3 inches) & didn't have to buy new shoes to go with the dress. I received so many compliments, and I felt beautiful. I got two sizes, 4 and 6. The 4 fit perfectly and was almost too snug, but it was good in that it didn't fall off when I was dancing. The 6 fit too, but the bust was insanely large on me! Overall, great rent! Came on time. The dress fit me perfectly and the length was long even with 3 inch heels. I absolutely loved the color and received compliments all night. This dress is beautiful and I received a lot of compliments on it. As a lot of reviewers have said, the color is great. I dropped a star because it's way too long. I'm 5'6" and was wearing 3" heels and it was still too long by at least an inch. If you can deal with that, however, I definitely recommend the dress. Great color and great fit! Ordered the tall and the regular length. I ended up wearing the regular length with flats (5'10") but if I wanted to wear heals, definitely would have needed the longer length. Very flattering fit, got lots of compliments! 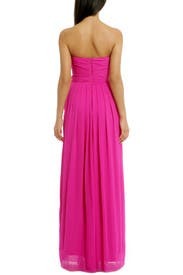 Perfect for a black tie wedding in May! This dress was amazing. I ordered a four and a six and ended up wearing the six (I didn't even try on the four). It was very true to size. I'm fairly tall and wore four inch wedges with the regular length and still had an inch or two at the bottom, which was perfect because my less formal shoes were hidden. I think with heels the bottom might've gotten a bit torn up. I don't know what a shorter girl would've done--probably a lot of hem tape required. Super flattering, would definitely rent again or even buy if I came across it in a store! 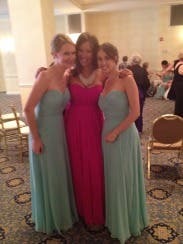 All three dresses I ordered were in great condition when they arrived and the process was seamless. I loved this dress so much! Everyone complimented the color and style. It was great to accessorize with bc of its simplicity. Only con is how excessively long it was (even with 4 inch heels). Overall a great pick! This was my first experience with RTR. I ordered a 4R and 6R. The 4R fit great but I noticed there was a large stain on the back. I called them up immediately and they asked to see a picture. I emailed Toni a picture and they immediately got back to me and told me they would credit me 25% the cost of the dress. 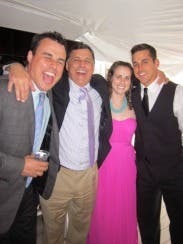 I still wore the 6 since the wedding was the next day but I was pulling it up on it all night. The dress is very comfortable and flowy. My only complaint is its length. With 4 inch heels it still was a little bit long. Otherwise I loved it and will definitely be renting again. Loved this dress, it was beautiful! It was a beautiful color and fit perfectly. 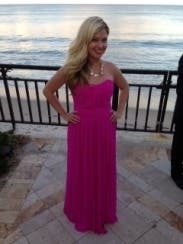 I wore it to a black tie wedding near the beach. I'm just over 5'5 and wore almost 4in heels, and the dress was almost floor level. So the dress was long like the other review say, but it still fell to a pretty length on me (and better than being too short). I just had to make sure to be careful walking up/down stairs. Overall it's a great dress and I was very happy with it! Not very bump friendly for all-Didn't fit me due to the band at waist. Psyched when i found this in the bump friendly category. Although I ordered both the 0r and 2r, I couldn't wear either as both didn't fit comfortably. I am 20 weeks pregnant and although this may work on some women wo carry lower, my bump is pretty high and the band just was uncomfortable. 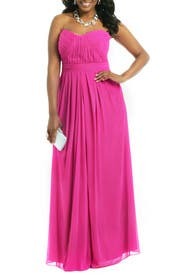 But I called up and spoke to a stylist who helped me find something else in time for the wedding I needed a dress for. Great experience even though this dress didn't work for me. Elegant and unique... I felt like a princess. The fit was perfect. I ordered a 2L and a 4L because I love extra length. I wore three inch heels and there was still plenty of fabric trailing the ground. The 2L fit me perfectly, but the zipper was broken. I was not able to get it zipped until we used chapstick on the zipper. It definitely sticks, but the half hour of struggling with it paid off. The only reason I would not give this dress 5 stars is because of that. 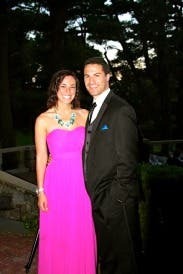 I received so many compliments on the dress because of its simplicity but fun and elegant color. Everyone was constantly complimenting me and asking me where I got it. Rent the runway is about to get a lot of new customers! Great dress, wore the back up instead. I rented this as my 1st choice for the Marine Ball in Las Vegas, but wore my back up rental instead. I ordered 2 sizes; 4-way too big, and 2 too much dress for my stature. The dress was beautiful! The color is more magenta in person than hot pink as the picture indicates. This dress would have been great on someone a little taller. I am just not used to a flowy dress. I realize now that I look better in Slimmer silhouettes. From now on I will always order a back up dress! Thanks RTR! felt like Cinderella minus the ball! i rented this dress for a summer wedding- though the dress was absolutely perfect, unfortunately the weather was not so my flight got cancelled! the color was stunning and the material perfect for a summer affair! 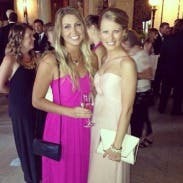 it certainly didn't get the debut i was hoping for- i will have to rent this dress again soon! This dress is phenomenal. The color is perfect and I was getting compliments left and right on it. I wore a long but I wish I would have gotten a regular since I was paranoid about tripping on it all night. But with my heels it was perfect. I wore my backup mostly so I didnt have to wear a bra and I knew it would stay up all night. I danced the night away without a hitch and didnt have to adjust the dress at all, it stay put. I was sorry to see it go, I would love to have it in my closet! Wore this to my prom, such a gorgeous dress! I would definitely recommend renting it! The color photographs beautifully and complements any skin tone. It really brightened up my fair skin and blonde hair for a fresh look! The sweetheart bust in 0R hugged my small bust just right (didn't wear a bra), be sure to stand up straight though because the top can look slouchy sometimes! I'm an athlete but I have a small waist so the 2R fit but 0R ended up fitting better. The dress is super long even in 4in. heels the dress was a bit too long for my liking. I accessorized with diamond studs and a sparrow golden pendent necklace - the dress was so gorgeous I didn't want to distract from its beauty! RTR was absolutely amazing - I'll be sure to rent again! Truly a gorgeous gown, I loved wearing it! Such a flattering fit! 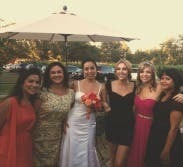 I am 5'11" and the dress was the perfect length, just brushing the ground when i wore flat sandals. So easy to dance in. I paired it with a BCBG belt i owned to further accent my waist. I love the added belt! Size 2 unavailable Size 4 was too large, too long, and wasn't as brightly colored as pictured. Had to go and purchase a gown the night before event... was disappointed to say the least. 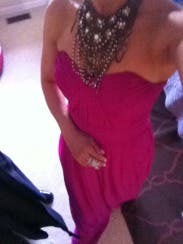 The necklace looks great with the dress! I have a large chest and it was a little hard to breathe but besides that, it was great. Nice dress, but wore my backup instead. The color is more purple in person than I thought it would be. 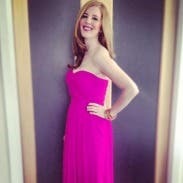 A lovely dress, but I decided to wear my back up instead - the Monique Lhuillier "Sweet as Candy" Dress. I'm 5'3 and the dress skimmed the floor with 4 1/2 inch heels. Beautiful, elegant gown. Loved wearing this color! Excellent fit. Thanks, RTR! I'm 5'8" and wore 4" heels and it was still pretty long. This dress was incredibly beautiful! I got so many compliments on it. The color ended up being more of a hot pink. I didnt actually need the long size (for those of you that are inbetween like myself). The dress fit really well overall but it wasnt the MOST flattering dress I have ever worn. It ended up making me look a little bit "puffy" in the midsection. Overall, I would rent this dress again! The dress was gorgeous. I got so many compliments because no one had anything like it! The dress fit great, I got a 2 for back up but ended up going with the 4 because the bust was a too snug with the 2. The regular was a little long, I was even wearing 4 1/2 inch heels and I probably could have gone with the short. Overall the dress was beautiful and comfortable. I definitely would recommend this! Perfect dress made for the perfect night! This dress was PHENOMINAL! Being my first time using RTR, I was fairly skeptical about what to expect. The dress was delivered, and fit perfectly! The material was great quality and the color was bright and vibrant, just as I had hoped. Also, being 5'10" I was worried about the length. However, the 4L worked wonderfully! 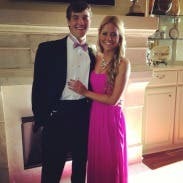 I have never received so many compliments, and it made for a night to remember! I will definitely use RTR again! You look GORGEOUS! Love your bright accessories. I love your accessories! I am built just like you... You are making me double think about pink! I imagine you’d look great in a paper bag but your look has decided for me that I’m going to get this dress! you all would look wonderful in this dress. It is definitely a great choice! Love your look. Where are the necklace and bracelets from and did you need to wear a bra with the dress or is there support built into the dress? Hi RTR Member! I got my necklace from Etsy. If you type in "Turquoise statement necklace" you'll get a million options to choose from. My bracelets are elastic and from Claire's. I wore a bra for a little extra lift, but the dress will definitely accommodate one if you choose not to wear it. It just depends on your preference :) I hope this helps! Gorgeous! What height shoe did you wear? I am the same height and am wondering if the long will work with flats. great dress, great color, loved everything about it! Beautiful dress for a special occasion! 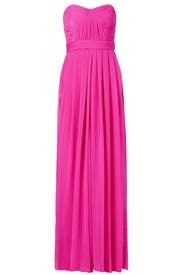 I wore this for a wedding where I was a bridesmaid and it was great for the occasion. The length was still too long with very high heels- I ended up getting a belt and pulling some of the fabric up over it to keep it from dragging on the floor. Overall great dress.